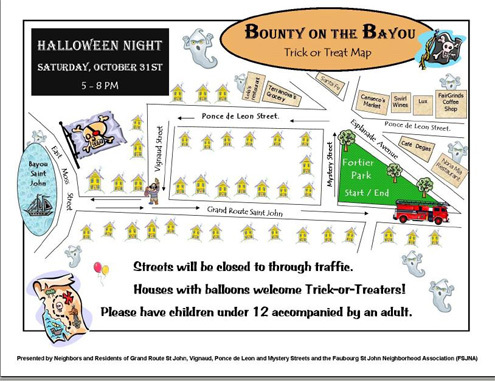 The Neighbors and Residents of Grand Route St. John, Vignaud, Ponce de Leon and Mystery Streets and by the Faubourg St. John Neighborhood Association invite one and all to the 2nd Annual Bounty on the Bayou. A safe Trick or treating event for the children in the community. Streets will be closed to through traffic. Houses with balloons welcome Trick-or-Treaters! Use Fortier Park as a starting/ending point, place to rest, kids can run around, play, meet, get a snack/drink that they provide and enjoy some Halloween music.